Sinead Moriarty is one of my very favourite authors and I have absolutely loved all of her books. Her stories are mainly set in Ireland and feature honest vibrant characters and enthralling story lines. She very much focuses on family and relationships and what it is like to be a modern woman. This is exactly the case with her latest book, Me and My Sisters which I found to be a truly wonderful read. The book focuses on three sisters (all aged between late thirties and early forties) who have totally different views on life. Julie is a harassed mum of four boys (including triplets!) she is literally just trying to make it through each day. She loves all of her boys but is beginning to feel worn down by the sheer drudgery of it all especially as the boys are nearly always not as well behaved as they could be. Sophie could not be more different and enjoys living a life of luxury with her husband Jack and their daughter Jess. Her days are spent lunching with friends, shopping for all the top designer labels and pampering herself. The third sister, Louise, is again entirely different. She is an extremely successful lawyer in London who lives for her work. Little do they all realise that very soon their lives are going to change beyond all recognition. The fascinating thing for the reader is to see how they all cope with their changed circumstances and whether their new situations will ultimately break them or make them stronger! I was really hooked by all of these stories by the very first page and I really warmed to all three of the sisters. Being one of three sisters myself, I could really identify with the relationships and the strength of the bonds between them, however different that they seem. I loved the sense of family that came through every single page and the way that the sisters were there for each other and supported each other even when they did not always approve of each others’ actions. I always thought that Me and My Sisters is an extremely well written book. I liked the way that the sisters all took turns in narrating different chapters and although all of these were written in the first person I did not find this confusing and always knew who was telling the particular part of the story. I also felt that because the book was written in this way that I got to know all three main characters very well which is why I warmed to all of them and kept on hoping that things would turn out all right in the end. The book is also very well balanced with the more serious issues that the three sisters find themselves facing being interspersed with some much lighter moments. These mainly involved the antics of their tree hugging, environmental protester younger brother Gavin and also some of the misdeeds of the triplets although Julie rarely finds these amusing. 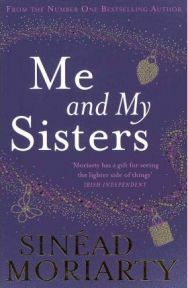 So overall Me and My Sisters is a fantastic book that left me wanting much much more. This is definitely Sinead Moriarty at her best, although I would have to say that this is the case of all her other books too. No Comments on "Me and My Sisters"